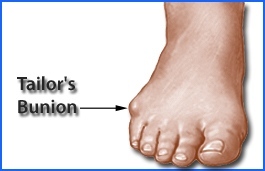 Depending on the severity of the deformity, there are different types of treatments available for Tailor's bunion. First line of treatment includes shoe modifiation, NSAIDs, orthosis and rest. If these treatments do not help to alleviate the symptoms, surgery to correct the deformity maybe necessary.